There's little surprise about this finding. In fact I was not surprised at all as I've been reading quite a lot about Singapore and was really impressed with their Government's effort to strike a balance between growing concrete jungle and catering for the monkey. Of course I didn't literally mean that! b) EIU - Economist Intelligence Unit (independent body) carries it out. 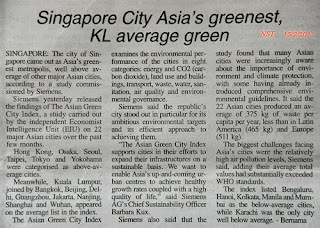 c) 22 cities in Asia were selected, including our capital Kuala Lumpur. d) Analyse their aims towards green environment and climate protection. Cities in Japan, Korea, Hong Kong and Taiwan occupy the second category, while KL sits "comfortably" (I think) at the AVERAGE. We had a vacation in Singapore in December 2010 and the first impression as we touch down and then on the drive ways is that the city is clean and the infrastructure is well-organised. Not a place to do your shopping spree tho, especially if you are coming from a country with less than strong currency exchange. So who are KL's peers scoring AVERAGE? Shanghai, Delhi, Beijing, Bangkok, to name a few. Who are at par with us does not really matter. What matters is the action taken towards achieving the target. 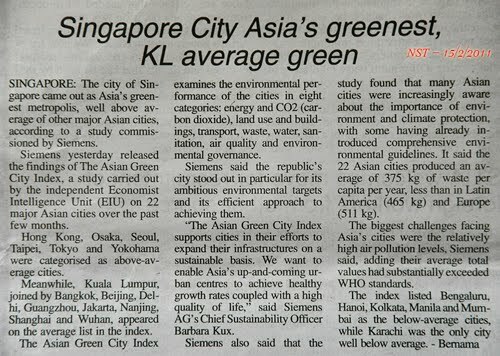 Every now and then we hear on our TVs and radios that Malaysia is taking this action and taking that moves, to show that we are committed to going green, and we now have one ministry that looks specifically into ensuring that the country will grow into developed industrial nation while maintaining sustainable implementation of Green Technology. It is good to have goals and it is good to bore the people to death with the awareness programmes, but is no good getting slow with actions and results. Green technology is not cheap (not just yet) but it's time we start adopting this in bigger scale, starting with energy and infrastructure. In short, think less about our plan to build more coal-fired power plants and spend a bit more on the more expensive renewal energy sources. Kota Kinabalu city is heading in the right direction with many implemented projects to beautify it, to make it eco-friendly, people-friendly but these are still at infancy. More effort is needed by the new Mayor. Like yourself, I am also a tax payer and I would not mind at all if Mr. Abidin Madingkir (our new KK Mayor) choose Singapore city as his first official oversea destination. Best of wishes to all of us in Kota Kinabalu and congratulations, Singapore!